Protecting Your Prop & the Environment! will prevent fishing line and downrigger cable from tangling around your prop. Prop Protection – Troll Prop Saver™ helps to protect your prop from underwater hazards, and enables you to get in close to those stumps, rocks, and seaweed where the fish are! Works great for gator hunting, floods, search and recovery, etc. 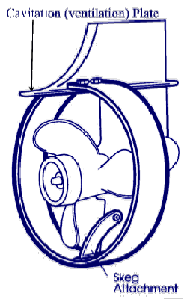 If you have a hydrofoil or a Troll Slow mounted, the Troll Prop Saver™ can be installed under the cavitation plate. Troll Prop Saver™ is not advised for use in shallow water running. Use River Runner™. Washington Residents: Add 8.8% Sales Tax – Tax will be applied at PayPal Checkout. Products made of high impact stainless steel.